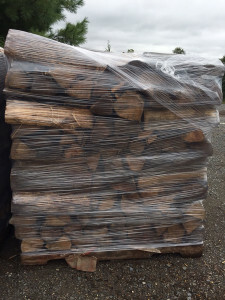 The current selection of firewood is freshly cut & unseasoned. Lumber Jake has firewood ready for delivery! We hand stack our firewood into neat half cord packages. What makes our firewood different is that the wood has no dirt or trash mixed in. After we hand stack our half cords, there is typically a pile of scraps, dirt and bark shreds on the ground – that doesn’t make it into the stack! You’re left with nice perfectly cut logs. 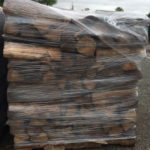 Our firewood is $185 per 1/2 cord. We deliver this palletized half cord of firewood to your home – our delivery fee is based on your location, so call today! A cord is 4x4x8 – four feet high, four feet deep and eight feet long. That’ a BIG pile of wood! When guys drive through neighborhoods selling “cords” of wood, you need to be really careful about how much you’re getting. A full cord is a LOT of wood. Most typical northern Virginia families won’t burn that much in a given winter (of course some of our loyal customers burn that and much more!). To make it easier to manage and give some flexibility, we offer our wood by the half cord – a 4x4x4 stack. A full cord is 128 cubic feet and a half cord is is 64 cubic feet. Sometimes our pallets are not quite 4×4, so to get the proper cubic footage, we make the pile slightly taller or shorter. But rest assured, we make sure you get exactly what you pay for! There is no mistaking your value. 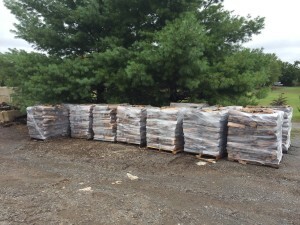 We charge a fee to deliver a half cord of wood within our delivery area in northern Virginia. Remember, it’s neatly palletized for your convenience. If you live in Washington DC or Maryland, we can quote you a delivery price, just give us a call.